The expertise of chemical engineers is essential to production, marketing, and application in such areas as pharmaceuticals, high-performance materials in the aerospace and automotive industries, biotechnologies, semiconductors in the electronics industry, paints and plastics, petroleum refining, synthetic fibers, artificial organs, biocompatible implants and prosthetics and numerous others. Increasingly, chemical engineers are involved in new technologies employing highly novel materials whose unusual response at the molecular level endows them with unique properties. Examples include environmental technologies, emerging biotechnologies of major medical importance employing DNA- or protein-based chemical sensors, controlled-release drugs, new agricultural products, nanoparticle-based materials, bio-nanoparticle conjugates and many others. Driven by this diversity of applications, chemical engineering is perhaps the broadest of all engineering disciplines: chemistry, physics, mathematics, biology, and computing are all deeply involved. The research of the faculty of Columbia’s Chemical Engineering Department is correspondingly broad. Some of the areas under active investigation are the fundamental physics, chemistry, and engineering of polymers and other soft materials; the electrochemistry of fuel cells and other interfacial engineering phenomena; the bioengineering of artificial organs and immune cell activation; the engineering and biochemistry of sequencing the human genome; the chemistry and physics of surface-polymer interactions; the biophysics of cellular processes in living organisms; the physics of thin polymer films; the chemistry of smart polymer materials with environment-sensitive surfaces; biosensors with tissue engineering applications; the physics and chemistry of DNA-DNA hybridization and melting; the chemistry and physics of DNA microarrays with applications in gene expression and drug discovery; the physics and chemistry of nanoparticle- polymer composites with novel electronic and photonic properties; programmable assembly of nanoparticle systems; DNA-guided assembly of inorganic and biological nanoscale objects.. Many experimental techniques are employed, from neutron scattering to fluorescence microscopy, and the theoretical work involves both analytical mathematical physics and numerical computational analysis. Students enrolling in the Ph.D. program will have the opportunity to conduct research in these and other areas. Students with degrees in chemical engineering and other engineering disciplines, in chemistry, in physics, in biochemistry, and in other related disciplines are all natural participants in the Ph.D. program and are encouraged to apply. The Department of Chemical Engineering at Columbia is committed to a leadership role in research and education in frontier areas of research and technology where progress derives from the conjunction of many different traditional research disciplines. Increasingly, new technologies and fundamental research questions demand this type of interdisciplinary approach. The undergraduate program provides a chemical engineering degree that is a passport to many careers in directly related industries as diverse as biochemical engineering, environmental management, and pharmaceuticals. The degree is also used by many students as a springboard from which to launch careers in medicine, law, management, banking and finance, politics, and so on. For those interested in the fundamentals, a career of research and teaching is a natural continuation of their undergraduate studies. Whichever path the student may choose after graduation, the program offers a deep understanding of the physical and chemical nature of things and provides an insight into an exploding variety of new technologies that are rapidly reshaping the society we live in. The Department of Chemical Engineering is continually striving to provide access to state-of-the-art research instrumentation and computational facilities for its undergraduate and graduate students, postdoctoral associates, and faculty. Departmental equipment is considered to be in most cases shared, which means that equipment access is usually open to all qualified individuals with a need to use particular instrumentation. The most extensive collection of instrumentation in the department is associated with the polymer and soft matter research faculty. Faculty banded together to create a unique shared-facilities laboratory, completed at the end of 2001. The shared facilities include a fully equipped polymer synthesis lab with four fumes hoods, a 10'x16' soft wall clean room, metal evaporator system, a Milligen 9050 peptide synthesizer, and polymer thin film preparation and substrate cleaning stations. Also installed are new, computer-controlled thermal analysis, rheometric, and light-scattering setups. Specialized instrumentation for surface analysis includes an optical/laser system dedicated to characterization of polymer surface dynamics by Fluorescence Recovery after Photobleaching and a PHI 5500 X-ray photoelectron spectrophotometer with monochromator that is capable of angle-dependent depth profiling and XPS imaging. The system can also perform SIMS and ion scattering experiments. A digital image analysis system for the characterization of sessile and pendant drop shapes is also available for the purpose of polymer surface and interfacial tension measurements as well as contact angle analysis. An X-ray reflectometer that can perform X-ray standing wave–induced fluorescence measurements is also housed in the new shared equipment laboratory, along with instrumentation for characterizing the friction and wear properties of polymeric surfaces. The laboratory also houses an infrared spectrometer (Nicolet Magna 560, MCT detector) with a variable angle grazing incidence, temperature-controlled attenuated-total-reflectance, transmission, and liquid cell accessories. These facilities are suitable for mid-IR, spectroscopic investigations of bulk materials as well as thin films. The laboratory also has a UV-Vis spectrometer (a Cary 50), an SLM Aminco 8000 spectrofluorimeter, and a high-purity water system (Millipore Biocel) used for preparation of biological buffers and solutions. Facilities are available for cell tissue culture and for experiments involving biocompatibilization of materials or cellular engineering. In addition, gel electrophoresis apparatus is available for the molecular weight characterization of nucleic acids. A total-internal-reflection-fluorescence (TIRF) instrument with an automated, temperature-controlled flow cell has been built for dedicated investigations of surface processes involving fluorescently tagged biological and synthetic molecules. The instrument can operate at different excitation wavelengths (typically HeNe laser, 633 nm, using Cy5 labeled nucleic acids). Fluorescence is collected by a highly sensitive photomultiplier tube and logged to a personal computer. Because fluorescence is only excited in the evanescent wave region near an interface, signals from surface-bound fluorescent species can be determined with minimal background interference from fluorophores in bulk solution. Chemistry Department. Access to NMR and mass spectrometry facilities is possible through interactions with faculty members who also hold appointments in the Chemistry Department. The NMR facility consists of a 500 MHz, a 400 MHz, and two 300 MHz instruments that are operated by students and postdocs after training. The mass spectrometry facility is run by students for routine samples and by a professional mass spectrometrist for more difficult samples. The Chemistry Department also provides access to the services of a glass blower and machine shop and to photochemical and spectroscopic facilities. These facilities consist of (1) two nanosecond laser flash photolysis instruments equipped with UV-VIS, infrared, EPR, and NMR detection; (2) three EPR spectrometers; (3) two fluorescence spectrometers; (4) a single photon counter for analysis of the lifetimes and polarization of fluorescence and phosphorescence; and (5) a high-performance liquid chromatographic instrument for analysis of polymer molecular weight and dispersity. Columbia Genome Center. Because of its affiliation with the Columbia Genome Center (CGC), the Department of Chemical Engineering also has access to more than 3,000 sq. ft. of space equipped with a high-throughput DNA sequencer (Amersham Pharmacia Biotech Mega-Bace 1000), a nucleic acid synthesizer (PE Biosystems 8909 Expedite Nucleic Acid/Peptide Synthesis System), an UV/VIS spectrophotometer (Perkin-Elmer Lambda 40), a fluorescence spectrophotometer (Jobin Yvon, Inc. Fluorolog-3), Waters HPLC, and a sequencing gel electrophoresis apparatus (Life Technologies Model S2), as well as the facilities required for state-of-the-art synthetic chemistry. 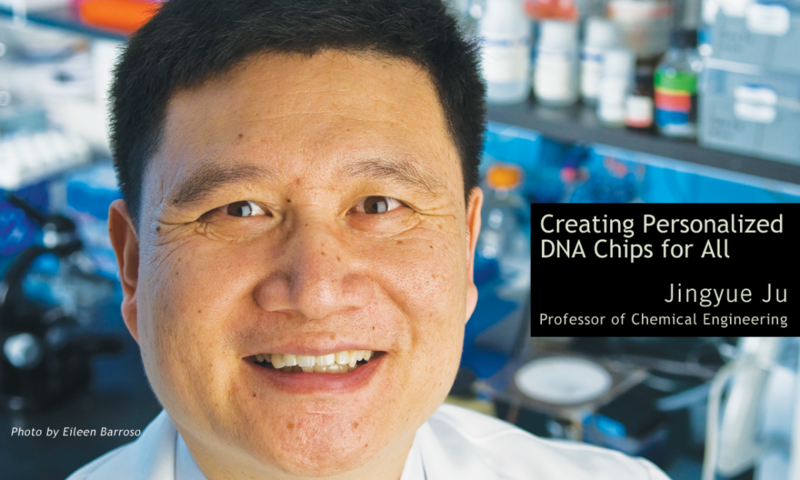 The division of DNA sequencing and chemical biology at the Columbia Genome Center consists of 6,000 sq. ft. of laboratory space and equipment necessary for carrying out the state-of-the-art DNA analysis. The laboratory has one Amersham Pharmacia Biotech MegaBace 1000 sequencer, three ABI 377 sequencers with complete 96 land upgrades, a Qiagen 9600 Biorobot, a Hydra 96 microdispenser robot, and standard molecular biology equipment.